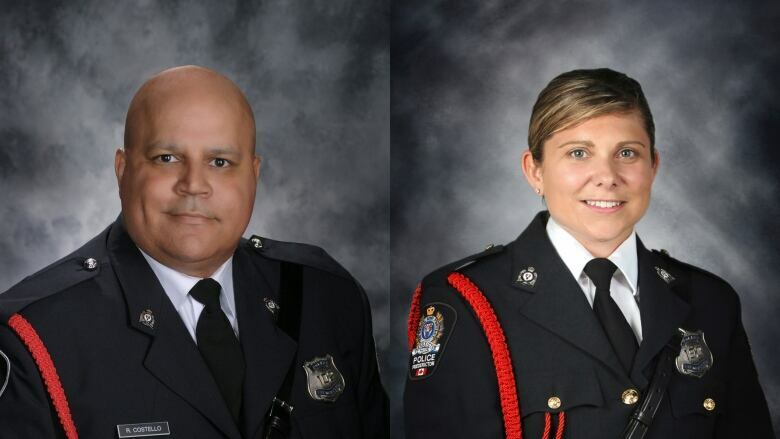 Just over a week after they were killed in the line of duty along with two civilians, Fredericton police Constables Robb Costello and Sara Burns were honoured in a regimental funeral before over 1,000 family members, friends, first responders and dignitaries, following a street procession that attracted hundreds on a rain-swept day. 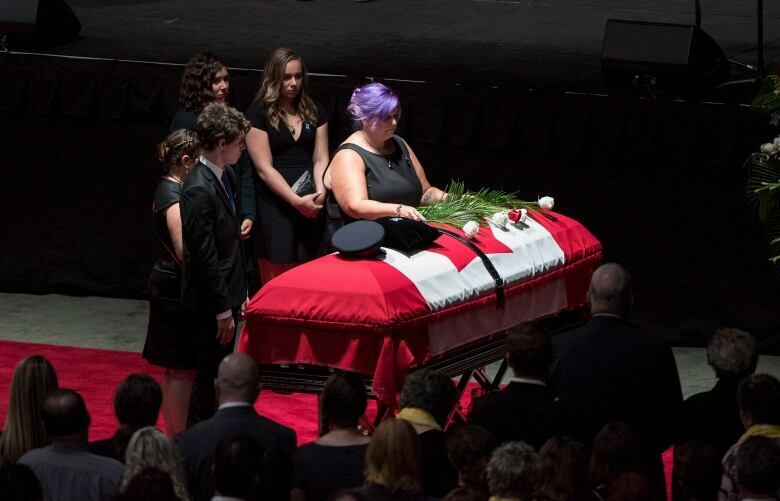 Steven Burns and his three sons wore yellow ties and placed four yellow roses onto one of the caskets belonging to Fredericton police Constables Robb Costello and Sara Burns — it was his wife's favourite colour and one of the many quirks he mentioned in his final goodbye to her. "Sara has always been my hero and my angel," he said during his eulogy at the regimental funeral Saturday in the New Brunswick capital. "But now she is a hero and an angel for a community, a province and a nation." 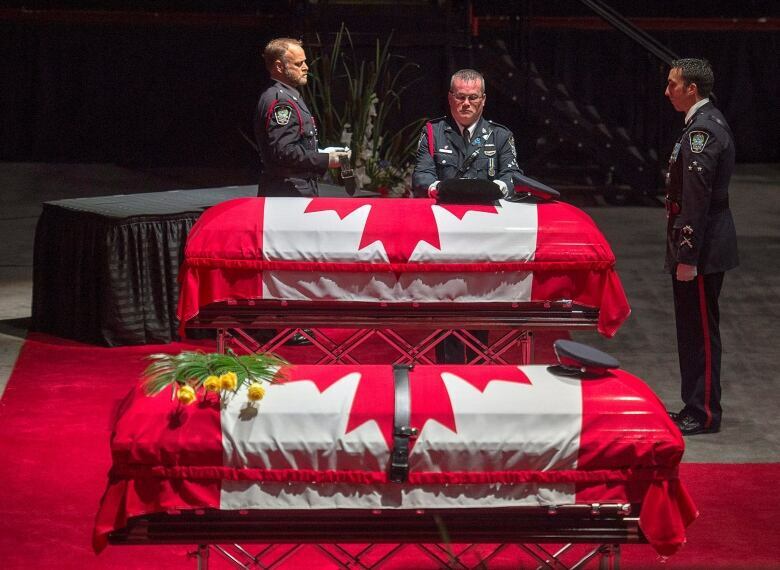 Just over a week after they were killed in the line of duty along with two civilians, Burns and Costello were honoured before more than 1,000 family members, friends, first responders and dignitaries from across Canada, in a service filled with personal stories of love and dedication to their jobs. The 90-minute service, in the Aitken University Centre arena, was also live streamed at two public locations — the Grant Harvey Centre at 600 Knowledge Park Dr. and Hope City Church, formerly known as Sunset Church — following an hour-long street procession. Costello, 45, and Burns, 43, were killed while responding to a report of gunfire at an apartment complex at 237 Brookside Dr. on the city's north side the morning of Aug. 10. Donnie Robichaud, 42, and his girlfriend, Bobbie Lee Wright, 32, also died. The two officers were the first on the scene and gunned down as they approached Robichaud and Wright. Costello was a 20-year veteran and father of four. Burns was a married mother of three who became a constable two years ago after serving as an auxiliary officer for two years. 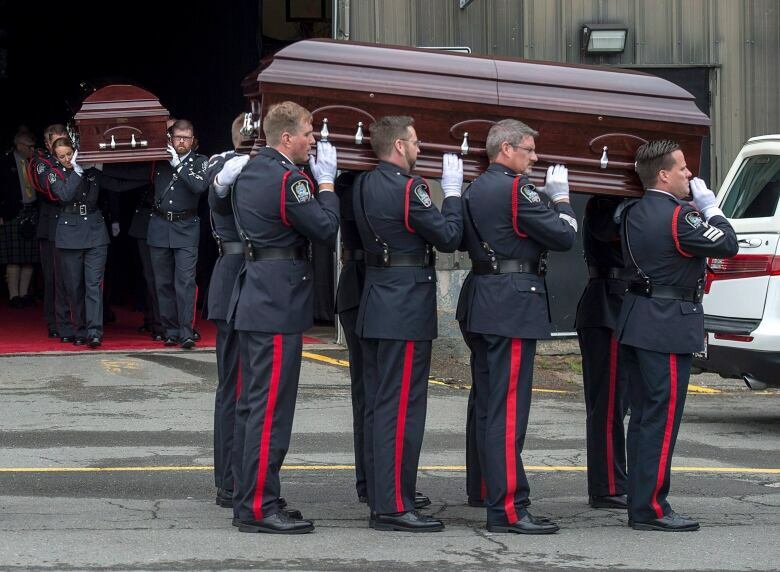 With members of the Fredericton Police Force, RCMP and agencies from across the country in attendance, Burns's husband gave a moving and personal tribute to his wife, calling himself "the husband of the most beautiful and caring woman I have ever met." On mobile? Follow our live coverage here. He spoke of her love for dragonflies, technology, travelling, online shopping, and passion in working as a police officer and taking care of others. "I can remember all too often driving in a car with her — just the two of us — and at mid-sentence she would just belt out, 'I love my job,'" he said. 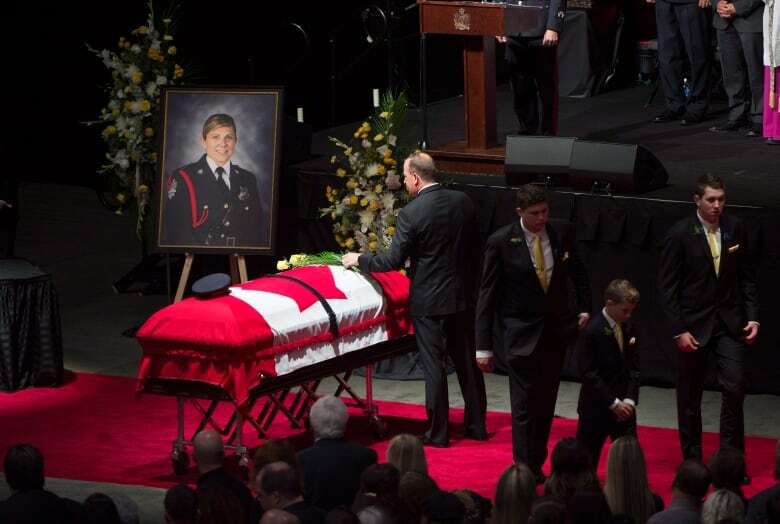 Burns said the fallen police officer was his best friend and spent the past 19 years also being "the best wife, mother, business partner, chauffeur, nurse and hockey mom" of their three sons: Duncan, Malcolm and Anderson. 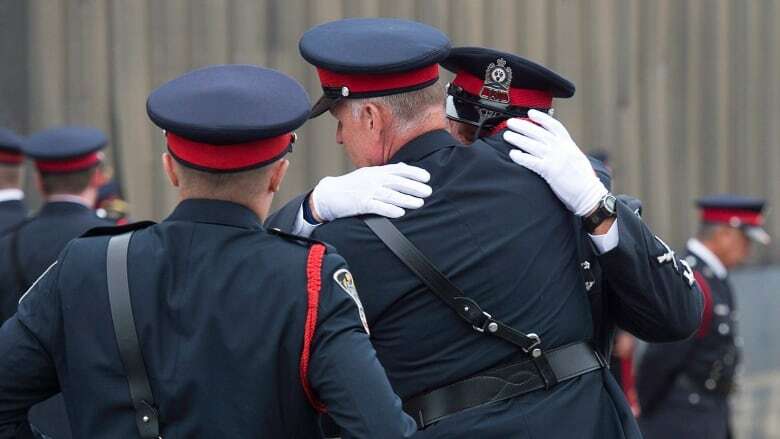 He also encouraged officers with the Fredericton Police Force to rely on one another during this time of tragedy and avoid blaming themselves for what happened. "I want you to know how much you all meant to her," he said. "I want each of you to know she is at peace and you did everything you could to protect her." Greg Morris, a family friend of the Costello family, described the veteran officer as a kind, caring and compassionate friend to those who knew him. Away from work, Costello was a big fan of the University of Notre Dame Fighting Irish football team in Indiana and "proudly" exchanged pins with the Notre Dame police. "You should know that the Fredericton Police Department is well represented at Robb's favourite Notre Dame University," Morris said. Costello also loved basketball, which he played at Sussex High School, the University of New Brunswick's Saint John campus and the New Brunswick Community College. I am so moved by the number of people out on the streets to view the procession. "His coach in high school mentioned that Costello was not the most skilled player, nor the fastest, or even the most athletic," Morris said. "But he was the most selfless. There was nothing he was not going to do for the team." Morris said Costello died doing the job he loved most and helping those around him, and served his community until that "tragic Friday morning." "Robb Costello didn't become a hero as he died. He became a hero as he lived." Morris also spoke about Costello's love for his partner, Jackie McLean, his mother Dolores Costello-Francis, his two children, Kassie and Kaitlyn Costello, and two stepchildren, Katie and Zach Steeves. "We will never forget you. You have finished your shift. You are off duty. Take a deep breath — you are home now," Morris said about his friend of 20 years. Throughout the service, the speakers also acknowledged the two civilians killed last week — Robichaud and his girlfriend, Wright — and their grieving families and friends. Fredericton police Chief Leanne Fitch held back tears as she spoke about Costello, who joined the force in 1998 immediately after graduating from the Atlantic Police Academy. That year, Fitch was Costello's primary field trainer and worked with him during his first stint on the job. From there, he took on several roles in the police force and New Brunswick RCMP. Fitch always made a point of letting him know he was a good man. "Robb wasn't even given the chance to use the full extent of his character and his skills last Friday," she said, referring to the day of the shooting. "And yet there isn't a doubt in my mind that he went into that situation willingly and bravely to his last call, which was the first call of his day." Fitch went on to speak of Burns and her determination to become a police officer, saying she was "inspirational" and considered "one of the finest of new officers with a bright future to match her beautiful, bright personality, enthusiasm and joy for life." Fitch said Burns had a special ability to calm people down and to de-escalate a crisis, but like Costello, didn't get a chance to use those skills before being ambushed on her final call on her night shift. "I always felt that our police department and our city were better because of her and that things would be OK in the years ahead," Fitch said. "I don't think Sara knew how proud I was of her and I'm heartsick to be too late in saying so." Fitch said both Costello and Burns died "a hero's death." She also spoke of how proud she was of the police officers' response to the shooting, noting: "Only you know how many lives you saved that day." Fitch also spent the past week with members of her force and the families of the two fallen officers. "Your Sara and your Robb were our Sara and our Robb too, and they will live forever in your hearts and ours," she said. "They gave their life selflessly as heroes." New Brunswick Lt.-Gov. Jocelyne Roy-Vienneau​. New Brunswick Premier Brian Gallant. Assistant Commissioner Larry Tremblay, commanding officer RCMP New Brunswick. Roy-Vienneau said people across the country will remember Costello and Burns every time they hear the word "hero." She met Burns when she joined the police force in 2016, and remembers Costello attending every medal ceremony to support friends and colleagues with a big smile. "They served, they protected, they helped others. They improved lives, they made this community better," Roy-Vienneau said. 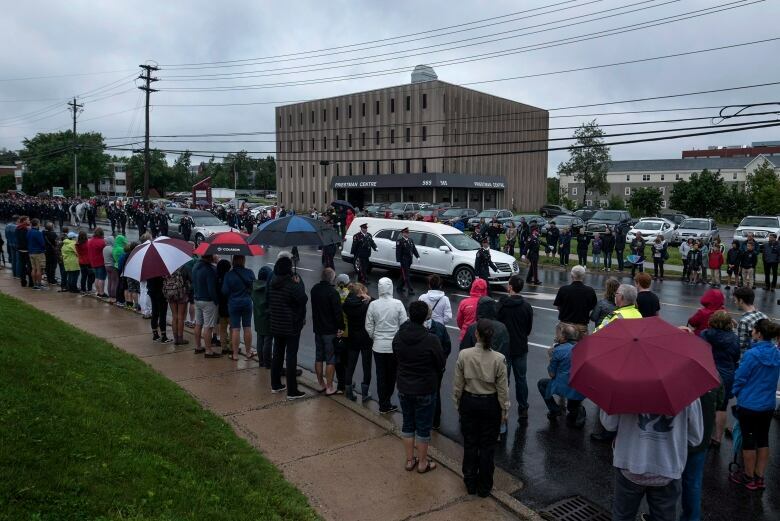 Priority for attending the funeral was given to the families of the fallen officers, Fredericton police and other law enforcement personnel. 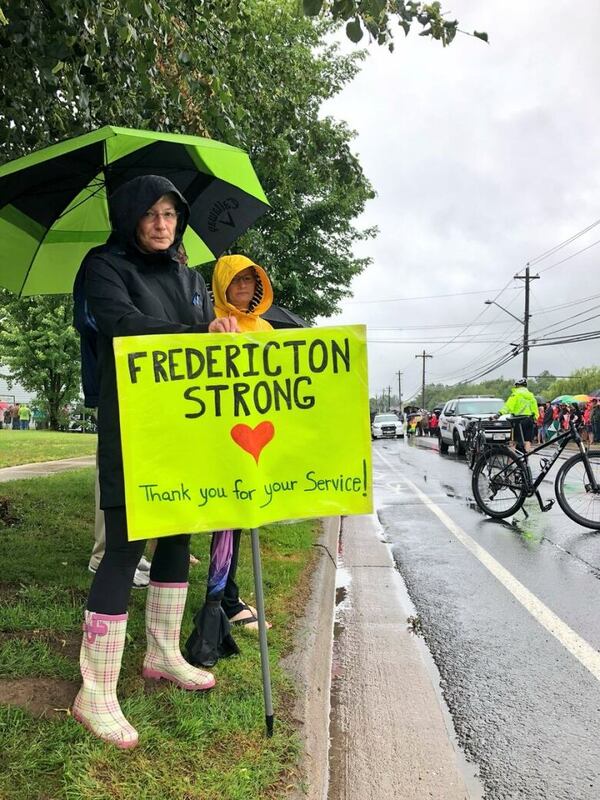 Although the funeral wasn't open to the public, it didn't stop people from lining the rain-swept streets of Fredericton along the route of the funeral procession of about 1,400 first responders. The procession started at noon AT at Fredericton High School, and moved along Priestman Street to Regent Street, down to Montgomery Street and across to the University of New Brunswick campus. Grimsby, a 10-year-old standardbred racehorse partly owned by Burns, followed behind the hearses. 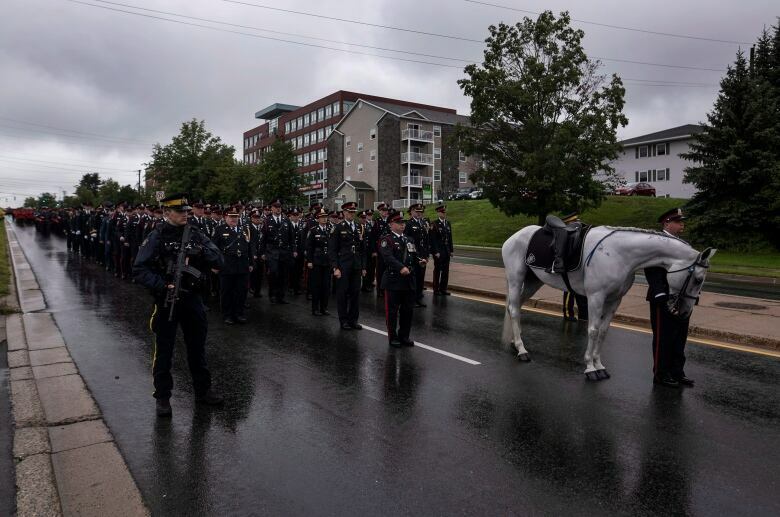 The horse was led by Grimsby's co-owner, Stefan Decourcey, a constable with the Fredericton police. 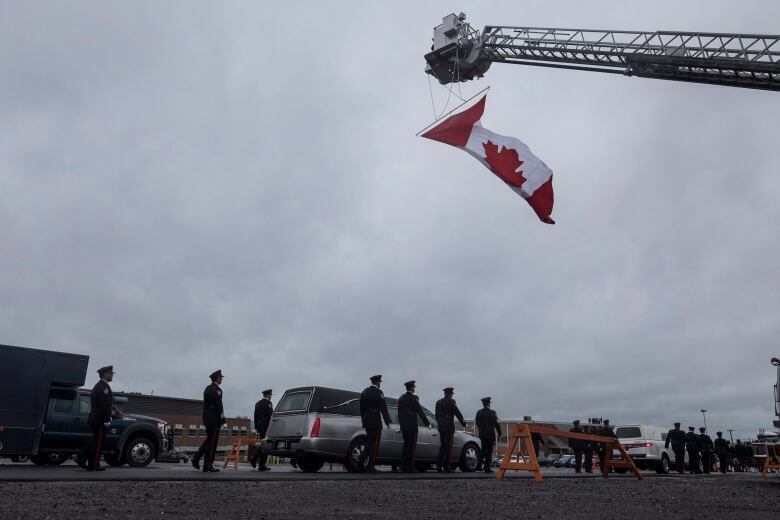 Annie Gregoire, acting superintendent for the Ottawa Paramedic Service, said the funeral is a stark reminder of the dangers first responders can face on the job. But she said the day will be about being there for one another as first responders, and ensuring people are not alone — especially the families of the fallen officers. "This tragedy has united a lot of us in the first responder community all across the nation — and actually all across the continent as well," Gregoire said. "The most important thing in times like these is to get together to support each other and pay our respects for the family and the people who are grieving." This is the second time in four years that first responders have gathered in New Brunswick to pay tribute to fallen officers. Three Mounties were killed and two others badly injured in Moncton in June 2014 after a gunman opened fire in the city about 180 kilometres east of Fredericton. 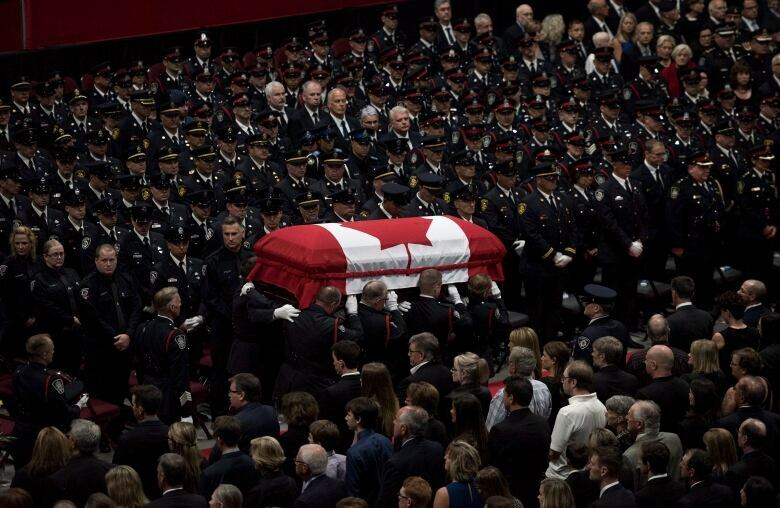 That funeral also drew thousands of RCMP officers and police officials from across Canada. Among those enduring Saturday's heavy rain and cold weather to line the funeral procession route to show their support for Costello and Burns was Rick Lingley, who was holding back tears as he stood beside his wife, Ann. His son has served as a police officer with Fredericton police. "Every day they put their life on the line for us," Lingley​ said before the procession started. He said he's proud of the City of Fredericton for rallying behind the police force during such a difficult time. "When this happened, it really hit home," said the Fredericton resident. "These are really good people, everybody that serves. They're human beings." 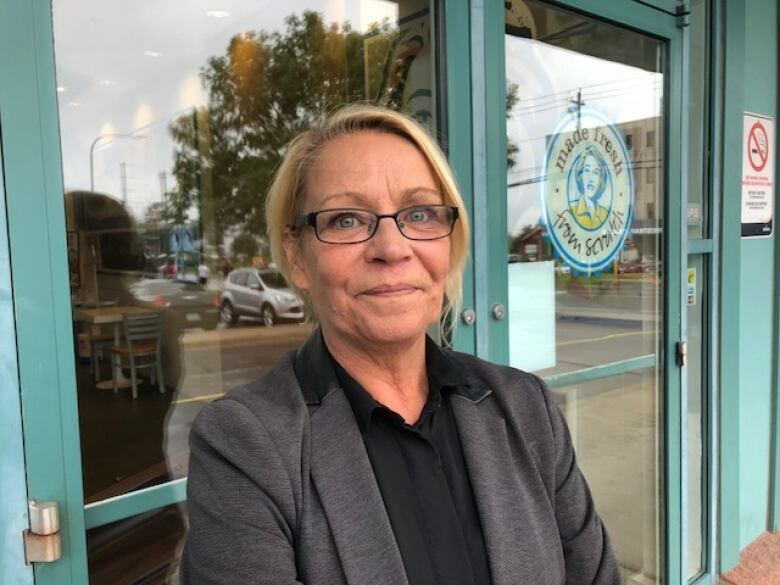 Sandy Adshade, general manager at Mary Brown's, a restaurant in a strip mall along the parade route on Regent Street, said she and her staff planned to watch from the sidewalk as the regimental parade passes. Adshade said she knows people in the community who were personally affected by last week's shooting. "It's been a tragedy," she said. "It's been a very hard week … it's not going away any time soon." The accused in last week's shooting, Matthew Vincent Raymond, 48, has been charged with four counts of first-degree murder and is scheduled to appear in court on Aug. 27.